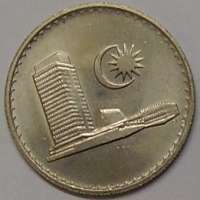 10 sen 1971 is part of the first series of sen coins that were introduced in 1967. What make it expensive was due to the number of its mintage. Unlike the same denomination of other year which was minted of millions of pieces, this particular year of 1971 has very limited mintage. Malaysian Houses of Parliament and the federal star and crescent moon derived from the canton of the Malaysian flag, representing Malaysia's Concept of Parliamentary Democracy and Islam as the official religion. The value "10" in the middle, with hibiscus flowers at the left and right of value. Word "Malaysia" and the year of minting and "SEN". The Malay name 'sen' was officially adopted as the sole official name in August 1975, previously known as "cent'. 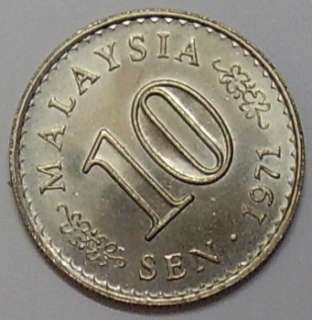 The symbol ¢ was no longer used as people are now comfortable to write in the form of RM0.10 instead of 10¢ whereby, the full spelling is also commin, 10 sen. Variety One: Die variety. It was released for normal circulation, darker and dimmed. Milled edge was bevelled. Harder and a bit more expensive than Variety Two even in EF quality. 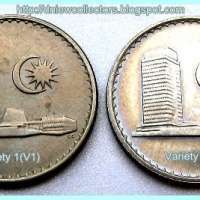 Variety Two: Second variety was minted in proof like condition, always in BU condition. It has squared milled edge. 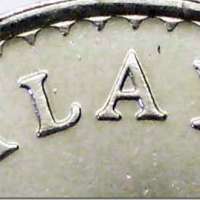 On the reverse, the device "MALAYSIA", there is always a small 'dot' in between alphabet "L" and "A", "MAL•AYSIA". First version of story was these 1971 10 cents coins were minted in London Mint. During then, Bank Negara Malaysia (BNM) was in the process of setting up local mint factory in Batu Tiga, Shah Alam. When the factory was ready to mint our very own Malaysia coinage in May 1971, they called up to put a stop to London Mint, however 32,236 pieces of 1971 10 sen coins were already minted. So, we took it. Second version of story was when our Shah Alam Royal Mint started its minting operation in 1971, Kuala Lumpur was hits by the biggest flood ever happened since 1926. Shah Alam Royal Mint in Batu Tiga was deep in water as well. Hence, the whole operation of minting was put on hold until 1973. 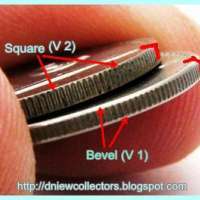 Another theory why the 1971 10 cents coins were minted only for 32,236 pieces was because due the dies broke. The first version of story, only 32,236 pieces were minted in London Mint is not convincing, London Mint can produce few hundred thousand of coins a day, unless they minted our Malaysia coin 1971 10 sen for a few hours only! The second version of story was not true because the worst floods hit Kuala Lumpur in January 1971, resulted 32 people were killed and 180,000 people were affected and Malaysia Shah Alam Royal Mint in Batu Tiga only started its operation on 4 May 1971. 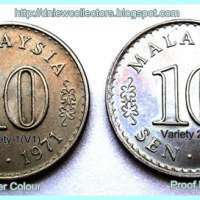 Could it be BNM realized that we had sufficient stock of 10 sen coins, a total mintage of 235,000,000 pieces were minted for year 1967 and 1968. In 1971, BNM minted 47.8 million pieces of 1 cent, 16.6 million pieces of 5 sen, 10 million pieces of 20 sen, 8.4 million pieces of 50 sen and 2.4 million pieces of One Ringgit coin, but why 10 sen were minted only 32,236 pieces? 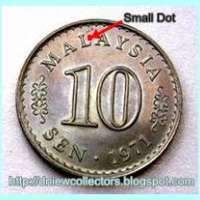 For the record, there were no Malaysia coin in any denomination being issued in year 1972.